If you follow me on Pinterest, you've noticed that I've been posting a lot of Japanese and Chinese links, including a bunch for sewn flower projects. This hair comb is inspired by those projects. I first saw the technique on a sunflower. Since I couldn't get to my large fabric stash, I had to work with what I had on hand, which was some jelly roll strip that were on my desk, so that limited the size. This is a largish flower sewn to a side comb. Because it takes only a small amount of fabric, charms and jelly roll strips work great, or scraps from sewing projects or salvaged scraps from old clothes. All the pieces are built off of circles. Because the width of the jelly roll is 2.5 inches, that was the radius of my semi-circle for the petals and leaves. If you're using wider fabric, you'll cut 3 5 inch circles, and cut them each in half for the petals. For the leaves, you only need 1 half circle. The center is 2 inch diameter circle. The piece of felt to sew all the pieces to is 1 inch diameter. Fold the petals in half, right sides facing each other, and stitch the straight edge. Knot off. Turn right side out using the chopstick to get the corner out completely. Do a running stitch along the rounded open edge, and pull tightly to gather. Repeat with the other 4 petal pieces. Now stitch the 5 petals together into a circle, pull tight! Tie a knot. Next you'll do the leaves. Cut the half circle for the leaves in half to make a quarter circle, fold right sides together, and stitch down the straight edge. Knot off, turn right side out, and stitch and gather the round bottom edge. Now to do the center. It's just a little puff in the middle. Do a running stitch around the center circle, pull to gather just a bit, put in a small amount of stuffing, then pull it tighter. Knot off and stitch the center on top of the flower petals. Try to enclose the raw edges of the flower center, and cover the raw edges of the petals. Flip it over, and stitch on the leaves. Then you'll sew on the felt circle on the back to cover all the raw edges. 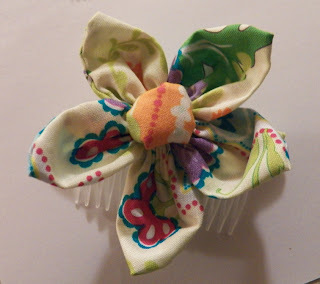 Attach to a hair comb, pin back or barrette! Looks like spring if you're as a eager as I am to start seedlings for summer gardens. We've been getting so much snow that my husband doesn't understand why I'm looking at seed catalogs and sighing happily!